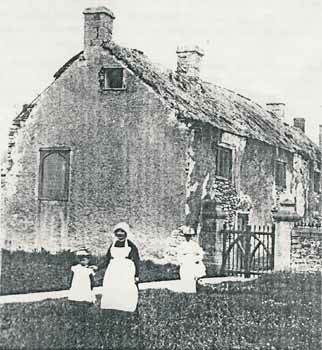 The cottage in which John Locke was born, shot from within All Saints' churchyard, looking towards the north gateway, which is virtually identical to today's. First, the facts: his mother Agnes Keene, baptised 24th April 1597 daughter of Edmund Keene, married John Locke in All Saints' on 15th July 1630. Edmund Keene was a tanner, and in his will referred to "a marriage shortly to be solemnised between my daughter Agnes Keene and John Locke, son of Nicholas Locke of Pensford". 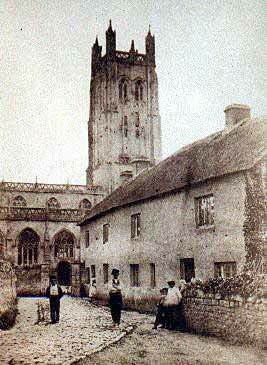 Edmund was buried on 15th April 1630, and his wife Mary on 20th October 1638, she in the church. The Nicholas Locke mentioned in the will was a member of a Dorset family who had migrated to Somerset, and presumably settled in the hamlet of Belluton close to Pensford, to be mentioned later. "The" John Locke was baptised in All Saints on 29th August 1632, son of John Locke -mothers were not recorded in our baptismal register until that practice began several years later. Now some more facts: I do have the baptismal, marriage, and burial registers for All Saints' since they were first ordered to be kept in 1538, and my own card index of every name up to 1861. I have found all too often when digging out the forebears of some enquirer that not only is the saying in respect of rural parishes that all the inhabitants had been "bred, wed, and dead" there was as far back as Tudor times complete nonsense. I do not attempt to investigate the registers of adjoining parishes, but it is obvious that men did go and marry somewhere else when the first baptisms of children to a married couple began appearing in All Saints' registers when no marriage here was recorded. Quite clearly it was in earlier times quite usual that young mothers-to-be went home to their own mothers for at least the first lying-in, and because of high rates of mortality of the newborn, and the then religious conviction that unbaptised infants could never enter Heaven, but were condemned to languish for ever in purgatory, very early baptisms were customary, usually bringing to a halt the search for forebears. an old thatched cottage adjoining the churchyard. I also remember one other possible source of error though for the moment cannot lay my hands on it: that also repeated having been taken in labour in the church without mentioning why his mother was there at the time. If, as I have tried to explain above, that John Locke's mother Agnes was staying with her own mother at the time, her being in the church was quite understandable, but this wasn't made clear in this particular source. Finally, I attach a photocopy of an undated lantern slide of John Locke's birthplace showing quite clearly that the cottage was immediately on the road leading from the north gate of the churchyard and not, as in some quite fanciful drawings, as in Dugdale's Book of Monuments 1640-41, with an extensive front garden. Furthermore, that picture omits the fact that there was a second cottage - as hinted, in particular by the chimneys, on the lantern slide. were demolished about 1891, at the moment I cannot locate my note of the exact date: their gardens were acdded to the churchyard in 1894/5, just before the big auction of the whole of the Manor in April 1895. 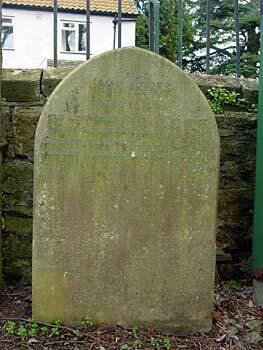 An amended tablet in 1926 leans against the wall inside the churchyard not far from the green gas meter structure.